Oh Sölden. You were eventful to say the least. This was my first skiing trip in a few years. The last time I went skiing was when I was in college and that was a wild trip! I’ve been wanting to go back skiing for years so I decided to go this year. You’ll see it all in my YouTube vlog below, but basically on the first full day of the trip (we arrived the night before), we strapped on our boots and headed up the gondola to the slopes. I started on a blue run to try to ease into it. First run of the day, I was a bit shaky but I knew I could ski if I just relaxed. On my right, very close to me, was a mom and two really young kids she was teaching to ski – younger than four years old. I swerved left to avoid them, picked up a lot of speed, my skis crossed and mid-tumble, I knew I had hurt my knee. Cue snowmobile down to the gondola, wheelchair in the gondola, ambulance to the doctors, lots of waiting, confusion, x-rays. All to be told I had probably ruptured my ACL. I was strapped into a leg brace from upper thigh to ankle that kept my leg straight, given crutches, injections I had to give myself, tablets, the whole thing. I headed back to my hotel room and crashed for about 3 hours. I was completely drained. My sister FaceTimed me with my mom and we discussed getting flights home. I decided I wanted to stay. It was Thursday and I was due to go home on Sunday anyway, so I figured I’d stay and make the most of it. I’m so glad I did! Sure, I didn’t get to ski again (that would have been comical! 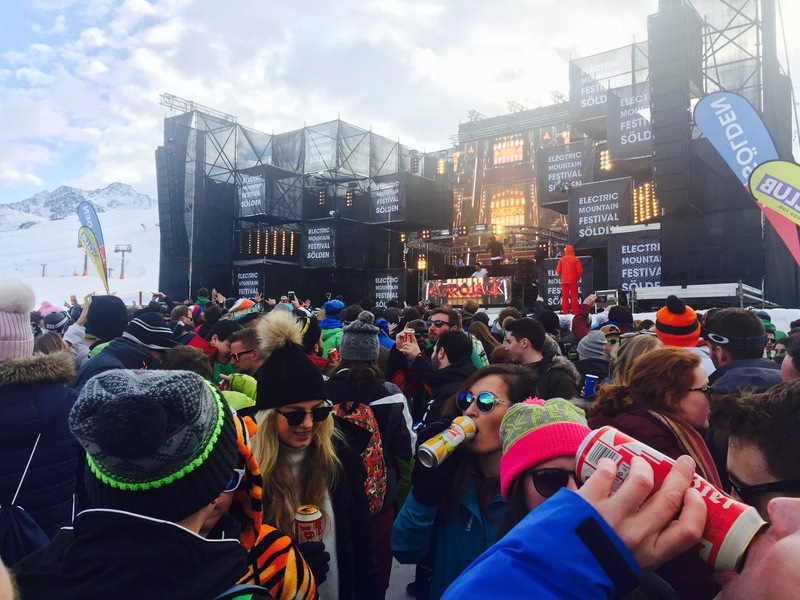 ), but unless you’re a die-hard winter sports person, we all know the apres ski is the best bit! I managed to head out for dinner and a few drinks that night. There were lots of other skiers about that were also limping around, or had their arms in slings. What can I say, winter sports are potentially dangerous! On the Thursday and Friday, Electric Mountain Festival was on, they call it Ibiza in the Mountains. I decided on the Friday that I was going to go. I hopped (literally) into a taxi to get to the gondola, headed up the mountains, and slowly, with my friends acting as bodyguards, made my way to the festival. I was brought a chair and chilled out in the snow in the middle of a rave essentially. It was too funny! I’d say I’m in about 20 other YouTube videos given the amount of people who came over to film me while shaking my hand, hugging me, or giving me shots of Jaeger. On the Saturday, we headed up to the location where they filmed the Bond movie Spectre, called Ice Q. It was incredible. The views are indescribable. You’re literally sitting at the top of a mountain, drinking a cold beer, with the sun beating down, and nothing but sky and snowy mountains to be seen. It was hard to film it and do it justice! This was a highlight, not just for me, but for everyone who went. If you’re ever in Sölden, go to Ice Q. It’s worth sitting there for an hour or two and having a drink. Food is really expensive, but if you’re looking to treat yourself, then this is the place as all the food looked incredible. The Sunday rolled around, and it was time for me to head home. My insurance company insisted that I have three seats on the flight home to put my leg up. Because of this, I couldn’t get either flight home that my group of friends was getting. So I had a three hour personal taxi/ambulance ride from Sölden to Munich instead. Once there there was a lot of fussing getting me around the airport in my wheelchair, getting me to the plane, getting on the plane. Despite getting better on crutches now, those first few days I was awful and very slow getting anywhere! I’ve been home three weeks now. I had surgery last week which went really well, and I’m adjusting to a new leg brace and crutches. I know I have a bit of a journey ahead of me with physiotherapy, but it’s ok. I’m very lucky that this is the first significant injury I’ve ever sustained! I think with winter sports, there’s always a risk. You could have an unfortunate fall like I did and just land the wrong way, you can crash into people, and don’t get me started on the dangers of going off piste! But, skiing (or snowboarding, whatever you’re into), is also a brilliant, activity filled holiday. Your adrenaline is high, the views are incredible, and we all know apres ski is amazing. If you’re thinking of going on a winter holiday once the season starts up again, consider Sölden. The population is less than five thousand people and it’s a little tricky to get to. But, they do have the mountain festival, really nice people, plenty of bars and places to eat, and the most incredible views at a Bond location. Pretty cool.